When it comes to premier public golf in Mexico, the Golden Bear is dominant. A recent Golf Advisor ranking names six Nicklaus Design layouts to its list of the Top 10 You Can Play in Mexico, including No. 1s (the plural indicative of a first-place tie), the Ocean Course at Cabo del Sol and Quivira Golf Club in Los Cabos. Nicklaus has worked with many of the country’s best coastal sites since making a splash at the 27-hole Palmilla Golf Club in Los Cabos in the 1990s, and today, there are 25 Nicklaus Design layouts in Mexico. Sharing the No. 1 spot, the Ocean Course at Cabo del Sol, Nicklaus’ second Signature Course in Mexico, opened for play in 1994. The Ocean Course intimately interacts with the Sea of Cortez. Since 2010, Cabo del Sol has pushed the fifth green closer to the shore and tinkered with its famous back-to-back par 3s at Nos. 6 and 7. These changes have enhanced this dramatic trio of holes. The free fish tacos at the turn prepare golfers for the epic final three holes back along the water’s edge. Fellow No. 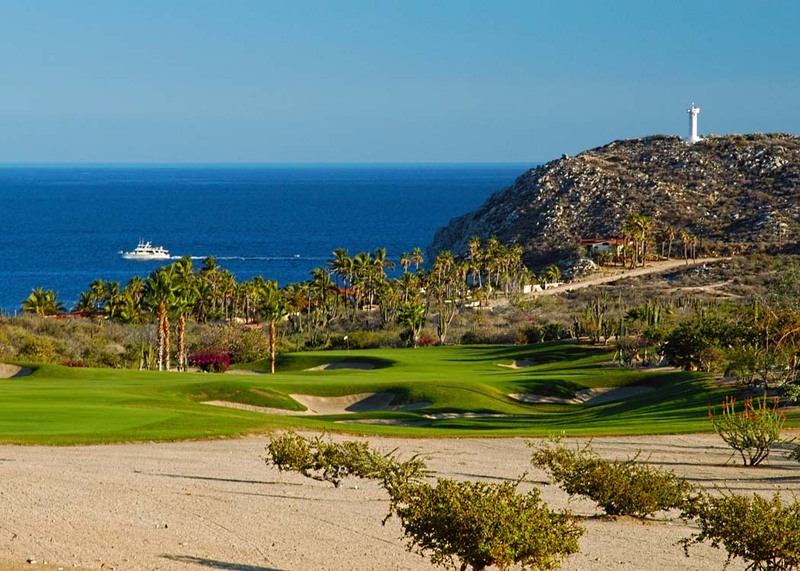 1, newcomer Quivira Golf Club, opened for play in December 2014, and shortly after was named Golf Inc. “Development of the Year.” No course showcases Cabo’s desert-mountain-ocean landscape better than this beauty near downtown Cabo San Lucas. Quivira’s gorgeous par 3s and a unique drivable par 4 cling to mountain cliffs above the ocean. Towering sand dunes frame other holes. The desolate desert sparkles on the final three par 4s at holes 16–18. The stunning setting is complemented by all-inclusive comfort stations. The Pacifico Course at Punta Mita Golf Club ranked No. 4 on Golf Advisor’s list. With eight holes on the ocean, this gorgeous Nicklaus course put Punta Mita north of Puerto Vallarta on the map in 1999. The famous “Tail of the Whale” hole—the extra par 3 called 3b—plays to a natural island green in the ocean. A raised, amphibious cart path allows access to the green at low tide. The Bahia Course at Punta Mita Golf Club ranked No. 5. The par-4 17th hole at Bahia challenges the “Tail of the Whale” as the best on the property. This Cape Hole — one of six ocean holes on Bahia — requires several heroic shots to avoid ending up on the beach. Nicklaus spiced up Bahia, which opened in 2009, by making it more difficult than Pacifico. Palmilla Golf Club, ranked No. 6 in Golf Advisor’s Top 10 You Can Play in Mexico, marked Nicklaus’ first foray into Mexico in 1993 with the Arroyo and Mountain nines, followed by the 1999 opening of the Ocean nine. Palmilla’s Ocean nine drops 600 feet in elevation during the first six holes, with the third green perched on the beach. A treacherous canyon surrounds the par-4 fifth of the Mountain nine. The course hosted an event on the 1997 Senior PGA Tour, as well as the 2007 Audi World Cup Finals, the biggest amateur event in the world. The Nicklaus Signature Course at Vista Vallarta Golf Club closes out the top-10 list. This club is 25 minutes from Puerto Vallarta, and delivers true jungle golf at the base of the Sierra Madre Mountains. It hosted the 2002 World Golf Championships, EMC World Cup and the 2006 Blue Agave Golf Classic of The Champions Tour.